When do you realize that a party has run out of ideas? It is when matters of common sense cease being so. For a person who is A' level equivalent before qualifying to become a Member of Parliament to shamelessly say that economic saboteurs should be shot, simply because they have used their Human Right is unfortunate development on the part of the Movement Government. It is sad we have to settle with them because the so-called 2011 Presidential Elections left them in office, otherwise, looks like we are wasting time. It is common knowledge that the economy id sabotaged by leading personalities in the NRM who make useless decisions and waste tax payers money on what is nor beneficial to the people of Uganda. Corruption is the order of the day given the few reports we are able to learn of. Cured is Uganda under the NRM leadership as the future is simply dark. President Museveni overseeing the NRM MPs and ministers parade at Kyankwanzi. National Resistance Movement (NRM) MPs meeting at Kyankwanzi have demanded that the Government introduces a ‘shoot-to-kill’ policy for people engaged in economic sabotage. The MPs argued that the policy would work well if Uganda was to transform from an agricultural economy into an industrialised one. Over 100 MPs are attending a 10-day retreat at the National Leadership Institute in Kyankwanzi. MPs were reacting to a paper presented by David Mafabi on imperialism, neo-colonialism and globalisation and their impact on the Ugandan economy. According to a press statement issued on Monday, President Yoweri Museveni asked the MPs whether they would support such a bill if it was presented before Parliament and all MPs chorused “Yes” in response. 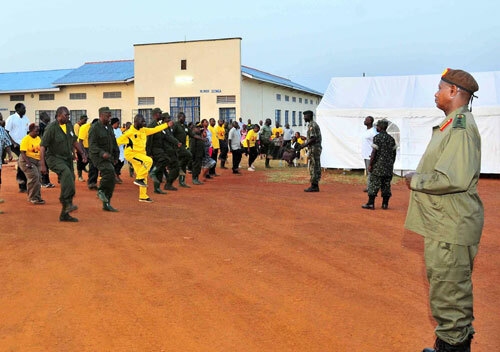 Last year, President Museveni attracted criticism when he suggested that people who engage in economic sabotage, murder, riots and defilement be denied bail. Human rights activists also rejected the proposal, saying bail is a human right. President Museveni also pointed out some of the contradictions involved in transforming from an agricultural to an industrialized economy. He cited the case of Dr. Florence Muranga’s banana project that was almost sabotaged because legislators sought the feasibility study from her, instead of helping her with economic research. The President defended Dr. Muranga’s initiative, saying he had stopped her from selling the patent rights to a foreign company in order for Uganda to directly benefit from her work. He said he would seek the allegiance of Parliament in securing funds for supporting scientists engaged in research and development for a five-year project to assist the Makerere University’s Faculty of Science and Technology in completing more research innovations. 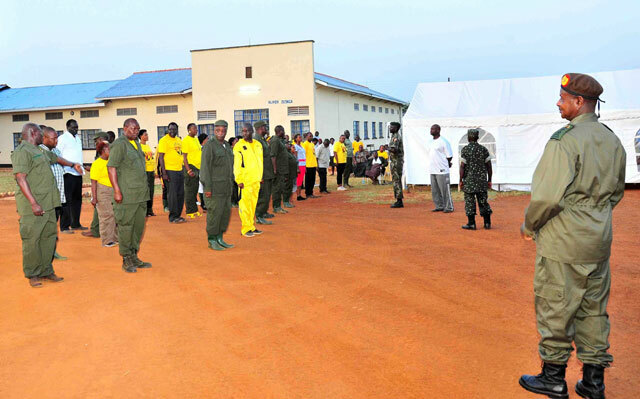 Prime Minister Amama Mbabazi also gave a lecture on the history of the NRM and its rise to power. According to sources that preferred anonymity, Mbabazi said the NRM cannot be compared to parties like the Uganda People’s Congress. “NRM is a party for all. It is very tolerant and it advocates for the economic, social and political transformation for all Ugandans,” the source quoted Mbabazi. He said NRM had encouraged the development and prosperity of all Ugandans through good governance and peace. Mbabazi added that unlike other parties that have regional biases, the NRM was enjoying support from across Uganda as evidenced in last year’s general elections. The MPs were also taken through lectures on neo-colonialism, imperialism and contemporary globalisation. The legislators proposed that Uganda needs to re-think its place in the global context by building awareness on issues that call for commitment within the development policy framework. The MPs also called for investment in non-traditional sectors of the economy, going beyond comparative advantage to building competitive advantage that works for fundamental socio-economic transformation. Members of the NRM parliamentary caucus are attending a 10-day retreat at the National Leadership Institute at Kyankwanzi. To the Government of Uganda, Members of Opposition and Distinguished Stake Holders. the strongest terms the following acts and violations. Articles 21 and 22 of ICCPR. the peace and stability in the country and should be halted forthwith. commodity prices through engagement and communication. perpetrated these human rights violations. parties, to discuss the national social issues prevalent in the country. property arising out of the intended peaceful ¡¥Walk to Work¡¦ campaign. and accept constructive criticism from all stakeholders.